As part of a Blog Tour organized by Great Escapes Virtual Book Tours, I recently read Murder is a Dirty Business, the first in a new cozy mystery series by Tricia L. Sanders. It was a great read – I’ll definitely be on the lookout for the rest of the series. I really enjoyed getting to know Cece, her family and friends in this light, well-paced mystery. The story is told from Cece’s point of view in a smooth conversational tone that makes it easy to identify with her. She is determined to remedy her financial problems with the kind of job most of us could never imagine taking on. She may not have worked for many years, but she is willing to what ever it takes to take care of her family. And when her daughter’s best friend, Kim, becomes the primary suspect in the murder of her husband, she is determined to root out the truth and prove Kim’s innocence. 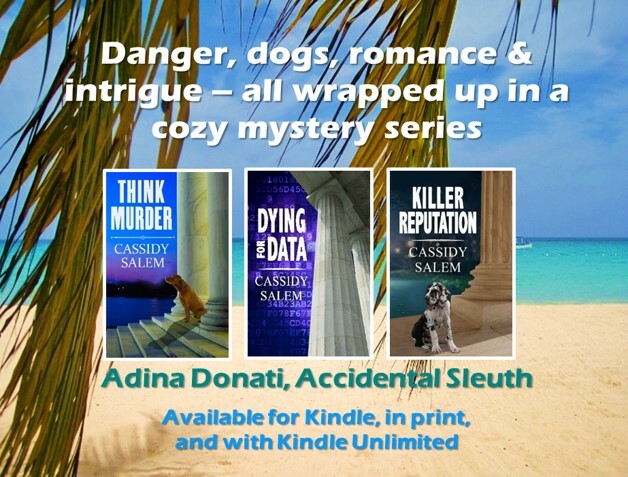 With twists and turns befitting a good mystery, and a sprinkling of humor and flirtation, this book is a very impressive start to what promises to be a great series by a new author. Click here to enter a Rafflecopter for a chance to win one of five $5 Amazon Gift Cards. Thank you for your review and information on “MURDER IS A DIRTY BUSINESS” by Tricia L. Sanders as well as being part of the book tour! This book is definitely on my TBR list and I’d greatly appreciate the chance to read it. Thanks for having me on Cassidy’s Bookshelves today. Cheers!